A case in point is sleeping sickness, a fatal neurological disease. Population displacement, political instability and collapse of health systems caused by civil wars have caused a dramatic resurgence of the disease. But although currently 60 million people in Sub-Saharan Africa are at risk of dying of sleeping sickness, it currently attracts virtually no attention or resources from the international pharmaceutical industry. Part of the problem is that the vast majority of people with Neglected Diseases live in poor countries and do not have sufficient income to represent a significant market. For this reason, research for Neglected Diseases has ground to a virtual halt. In addition, in the rare cases when new medicines are developed that can be used to treat Neglected Diseases, they are usually priced beyond the reach of those who need them or are not available because their producers have not found them profitable and have abandoned their production. To address this crisis of access to lifesaving medicines, MSF will use the proceeds from the 1999 Nobel Peace Prize to create the Neglected Disease Fund. The fund will be designed to support pilot projects world-wide that facilitate clinical development, production, and procurement and distribution of Neglected Disease treatments. Initial target diseases include sleeping sickness, leshmaniasis, tuberculosis and malaria. The projects will be implemented within MSF field missions and in close collaboration with local initiatives in developing countries. Additional contributions to the fund will be encouraged to expand the potential impact of the fund. 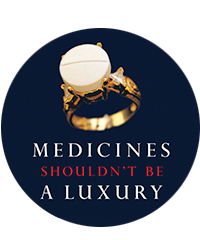 The fund will support the objectives of MSF’s first internationally coordinated campaign: Access to Essential Medicines. Grants will be given to overcome barriers to access of existing drugs and to stimulate development of new treatments. As doctors we deal with the human reality of suffering from curable and neglected diseases every day. This fund is designed to make an impact on that suffering.